Provide comfort for the family of Yolonda Penner with a meaningful gesture of sympathy. Peacefully at the Brantford General Hospital on Friday, March 29, 2019. Yolonda (Lonnie) Penner in her 92nd year. Beloved wife of the late Garf Penner. Loved aunt of Lonnie Doucet. Fondly remembered by her many nieces and nephews. Yolonda owned and operated Lonnie’s Ladies Wear on Charing Cross Street, in Brantford for 25 years. 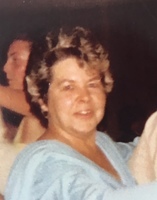 Friends will be received for a reception at the Charing Cross Reception Suites adjacent to the TOLL FUNERAL HOME, 55 Charing Cross Street, Brantford on Wednesday, April 3, 2019 from 4 p.m.- 6 p.m. Committal and interment service will be held at Greenwood Cemetery, Owen Sound at a later date. Donations to a charity of your choice appreciated. We encourage you to share your most beloved memories of Yolonda here, so that the family and other loved ones can always see it. You can upload cherished photographs, or share your favorite stories, and can even comment on those shared by others.